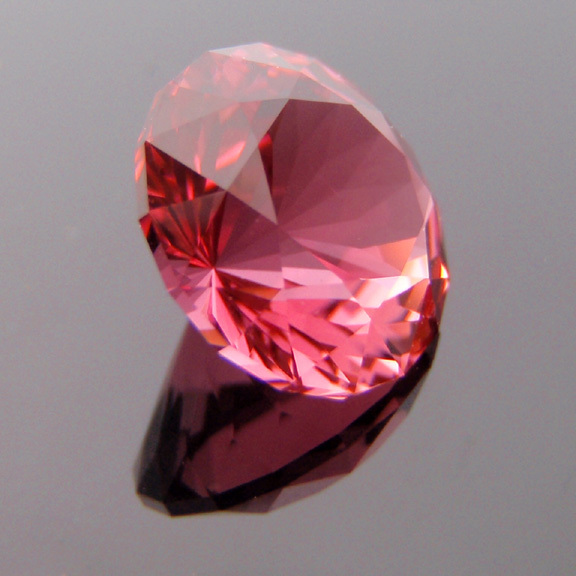 Comments : Here's a very flashy nice pink tourmaline from Afghanistan. 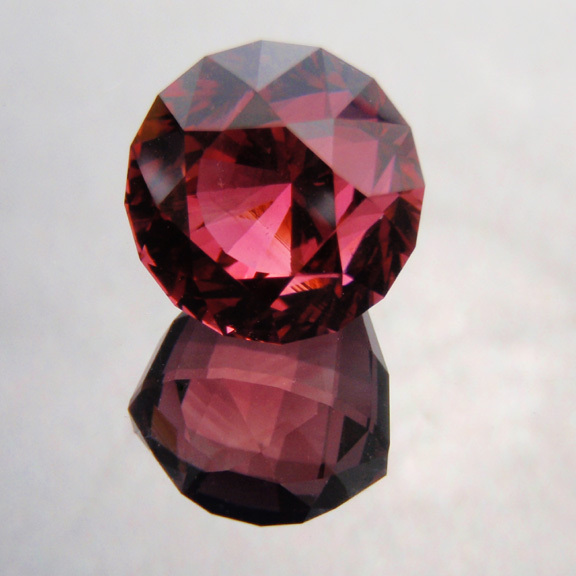 The design is the SG1 which is great for this material and really makes it a flashy gem. The colour is a beautiful pink with, to my eye, a slight "dusky" appearance. 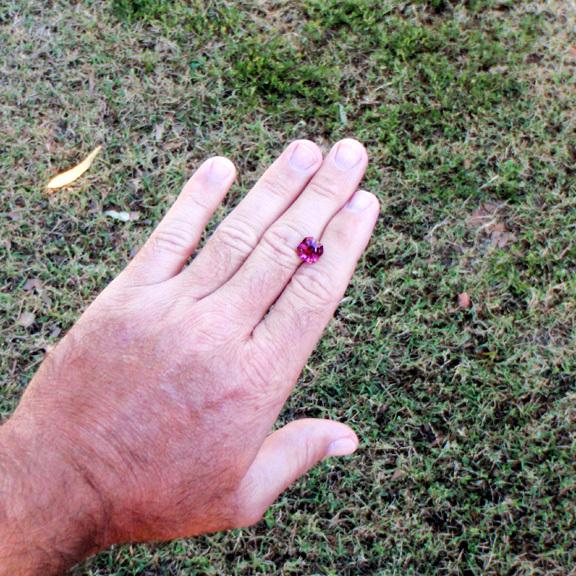 It is more saturated then the pics suggest, I think the pics look a little over exposed. 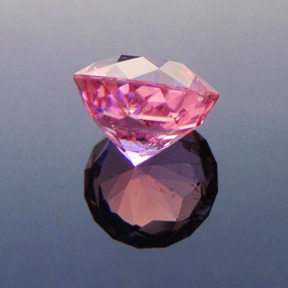 It is an excellent size for a ring or a pendant and is lovely and clean. In the sunlight it looks fantastic and equally so at night under lights. 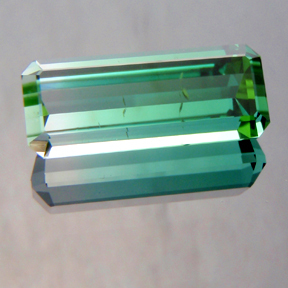 Comments : A spectacular green tourmaline gemstone. 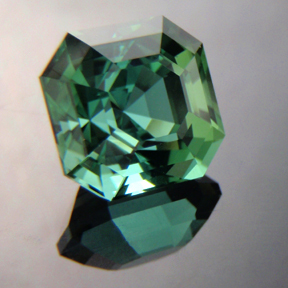 The colour is a very lovely green and the gem is very bright. 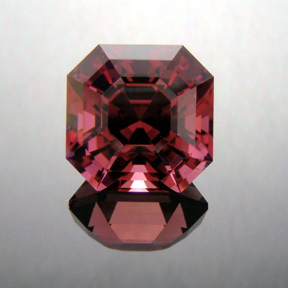 It is a fine tourmaline gem. 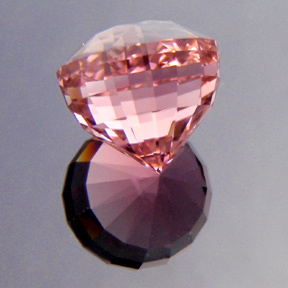 Comments : If you are looking for a sweet, pretty pink tourmaline, this one is for you. This lovely pink tourmaline comes from Afghanistan which produces some of the finest tourmalines around. 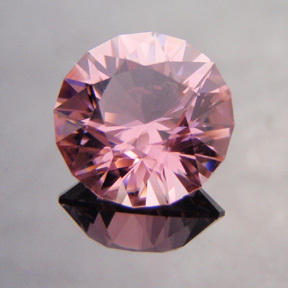 This beauty is a nice soft pink and it has a wonderful glow about it. 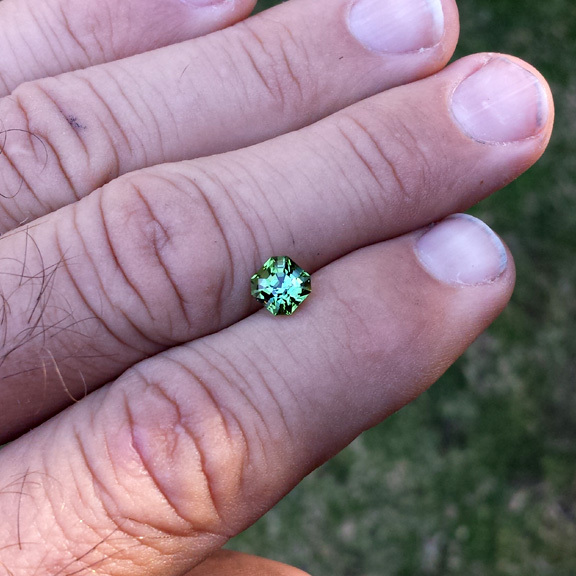 The Acorn design gives this gem alot of life and it would make a very special ring, probably in a white metal. 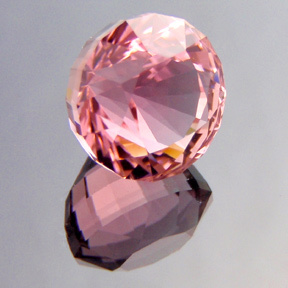 That would really highlight the pink colour and would look devine. 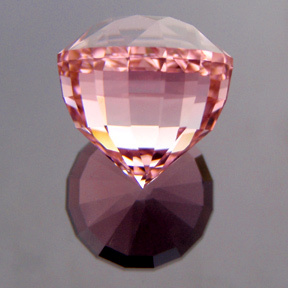 In real life the gem is prettier and pinker then the pics suggest. 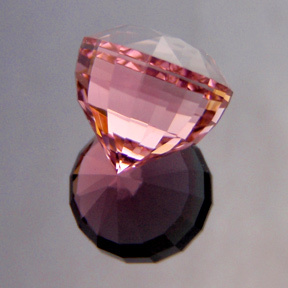 It does have some very minor inclusions that are common to tourmaline but you really need a loupe to see them. 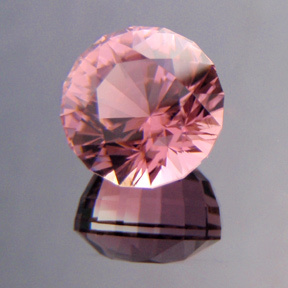 A very fine pink tourmaline gemstone! Comments : Imagine for a moment a bright tinsel pink flamingo and thats pretty much what you have here. 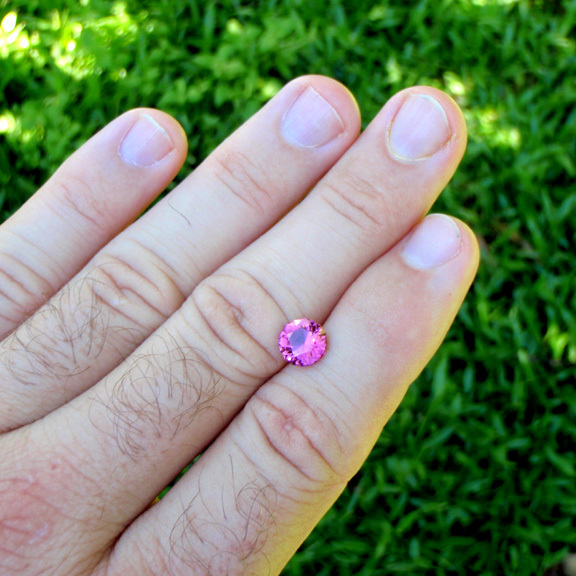 This is certainly one of the pinkest of pink tourmalines (or any stone for that matter) that I've seen in a very long time. It stands out across the room and at night, if anything its even better. 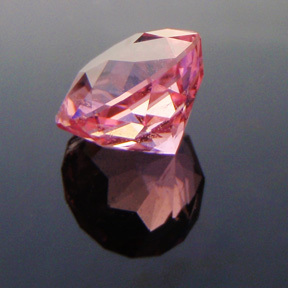 Under lights (both fluoro and incandescent) it remains stunningly open and vivid pink. This is one gem that you will take every opportunity to wear out at night, trust me. The pics again do not do this gem any justice as it is much more vivid and bright in person. 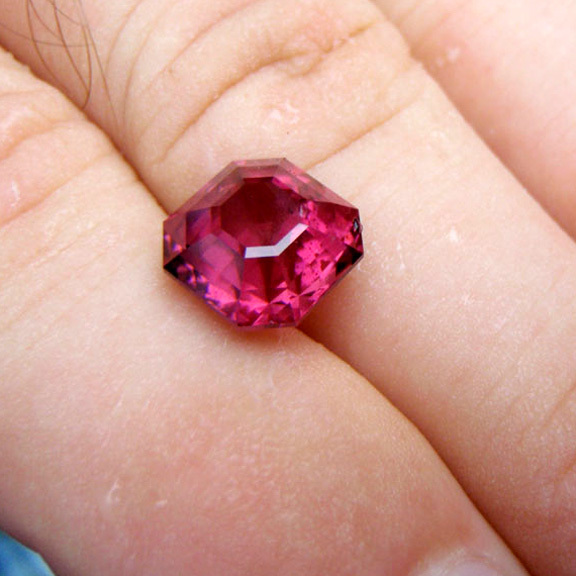 The gem does have inclusions which look far worse in the pics then they really are. 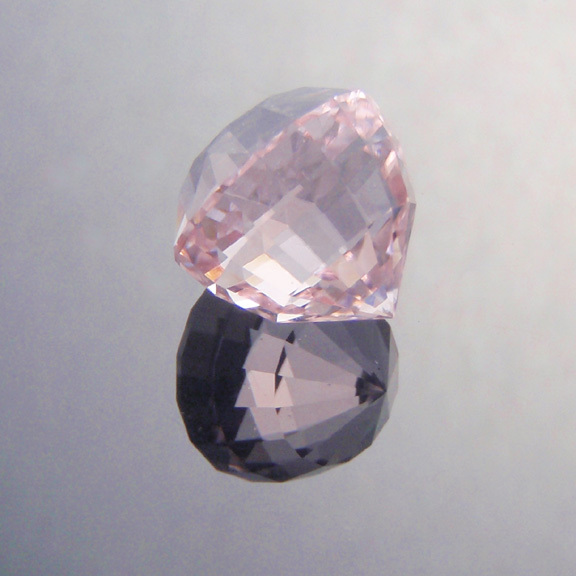 In person the inclusions look like a light dusting of speckles, like the stars of the Milky Way at night, only pink. 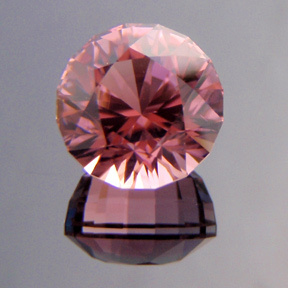 However, believe me when I say that with this colour, all inclusions are forgiven. There is also a very subtle violet glow about it that catches your eye from time to time and adds to this gems allure. This is an exceptional gem from a very collectable location. 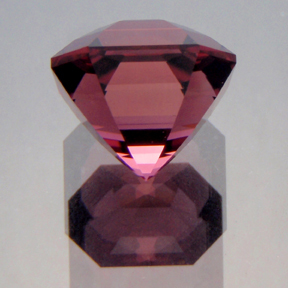 Comments : A truly beautiful, richly coloured rubellite tourmaline. 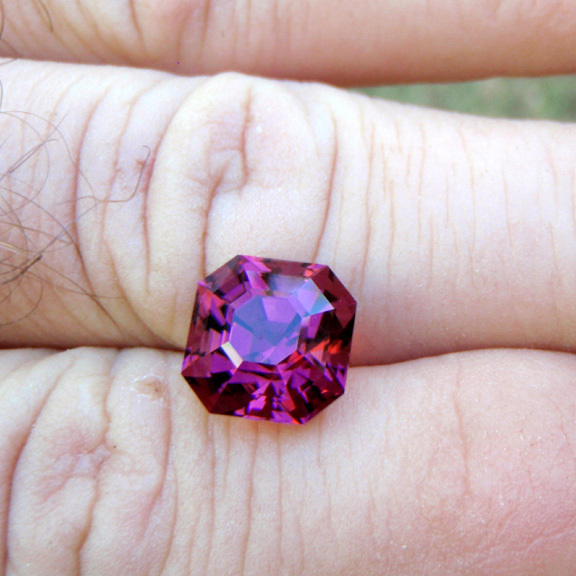 Straight off I'll say that the pics do not do this gem justice and they don't capture the colour as well as I would like. 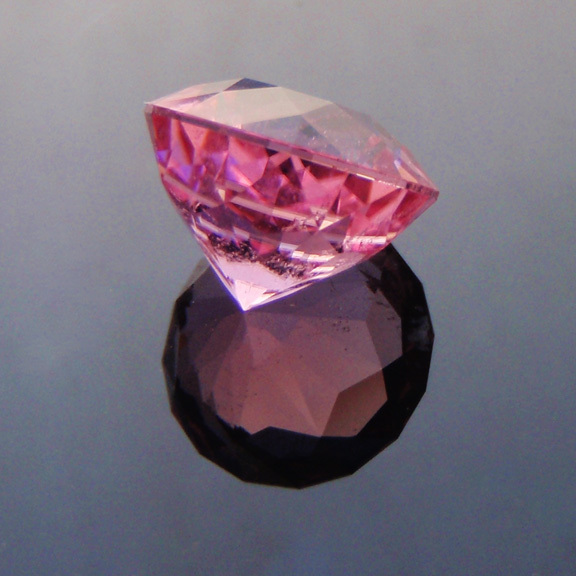 This was a hard one to photograph for some reason and I kept getting more pink coming through then what is there in real life. 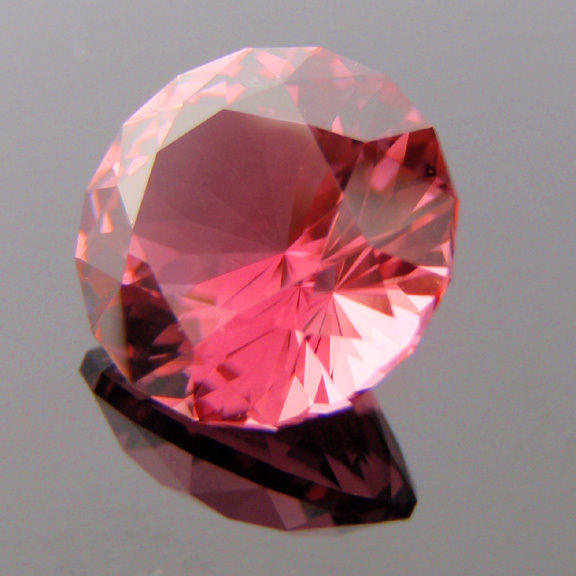 This gem is beautiful! 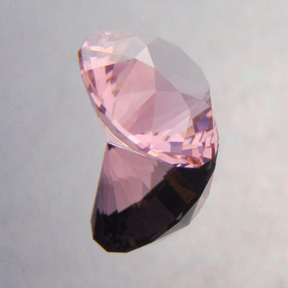 It is cut in my Acorn design which I feel has quite an elegant profile for such a deep stone. 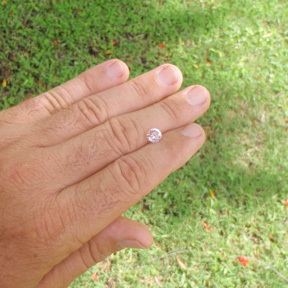 There is a minor needle like veil inclusion but is difficult to see in person. 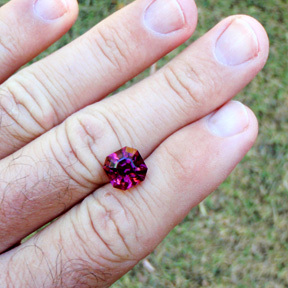 A very fine gem looking for a special setting. 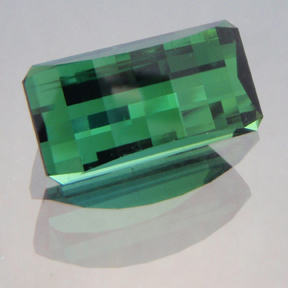 Comments : When it comes to Smith Bars, a rich green Afghan tourmaline is THE classic stone. There is something about this stone that so well suits the Smith Bar design. 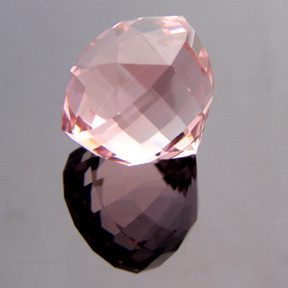 Perhaps it is the original crystal shape which is an elongated triangluar prism. 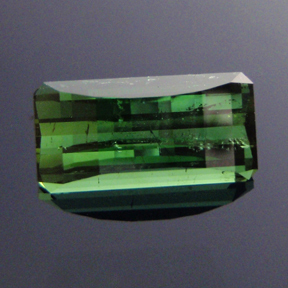 This gemstone exhibits two tones of green, a sort of deep lime green at one end changing to a rich slightly blue green at the other. It is the perfect size and shape for a stunning ring, pendant or bracelet. 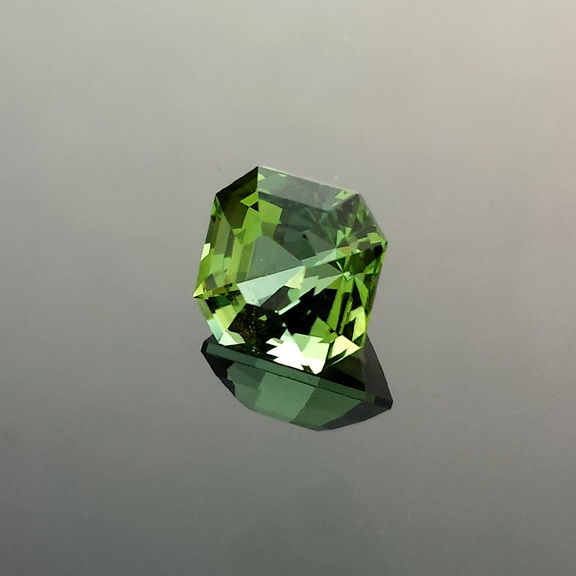 It is very slightly included with some of those small fine vertical veils that are common for tourmaline which in this stone are difficult to see face up and do not detract from its overall beauty. 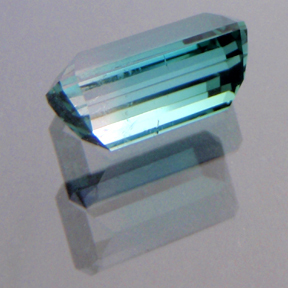 Comments : Indicolite (blue) tourmaline is probably one of the harder-to-find gemstones in the tourmaline family. 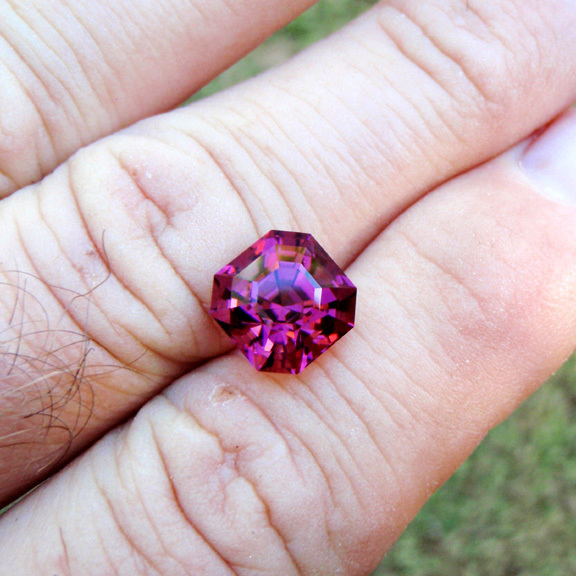 This is a lovely little gemstone cut in the favorite classic step design. 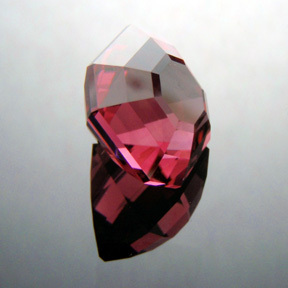 Towards one end of the gemstone it changes to clear and this makes for a very unique stone indeed. 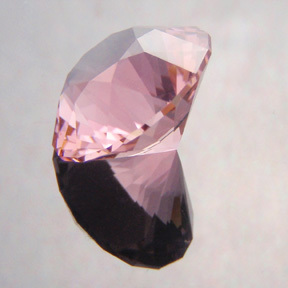 There are inclusions that are typical of tourmaline. 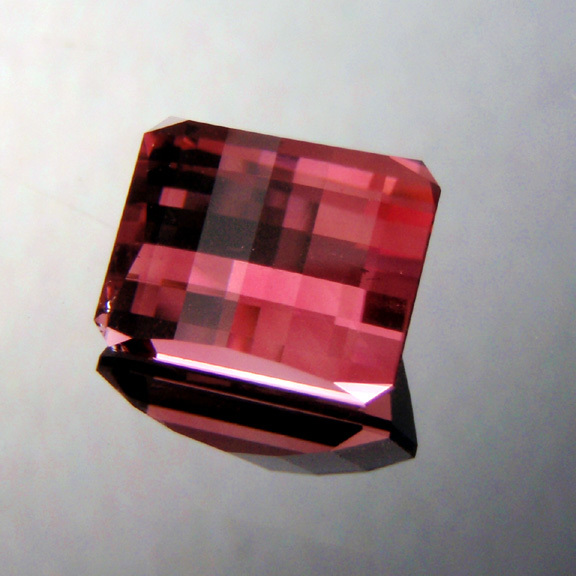 Comments : This is a lovely little bi-colour tourmaline from Afghanistan. 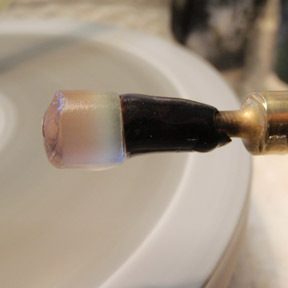 It is a green-blue colour one end changing to almost clear the other. There are several small inclusions that are typical of tourmaline. 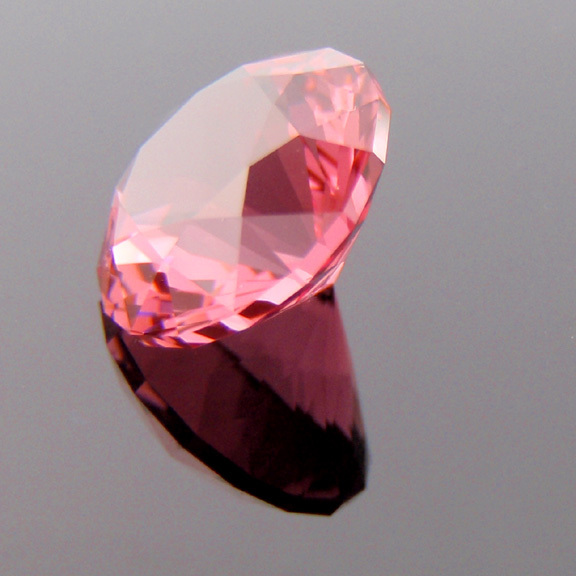 Comments : A stunning candy pink tourmaline from Afghanistan. 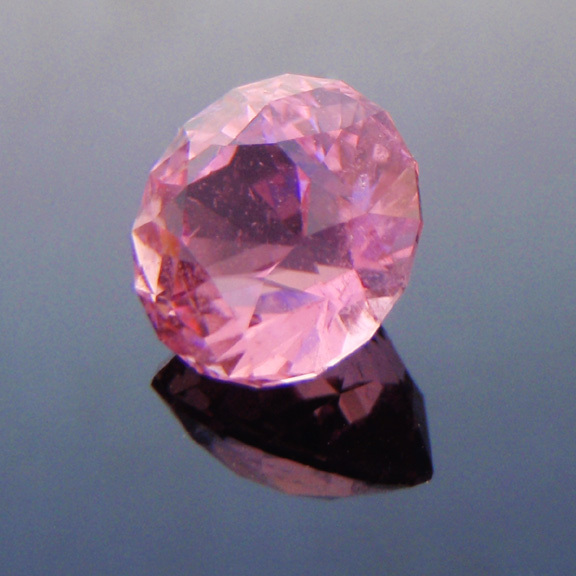 This gem has a wonderful appearance and the pink is fabulous and delicious... the pictures don't do it justice and the gem is much more vivid and flashy in person. 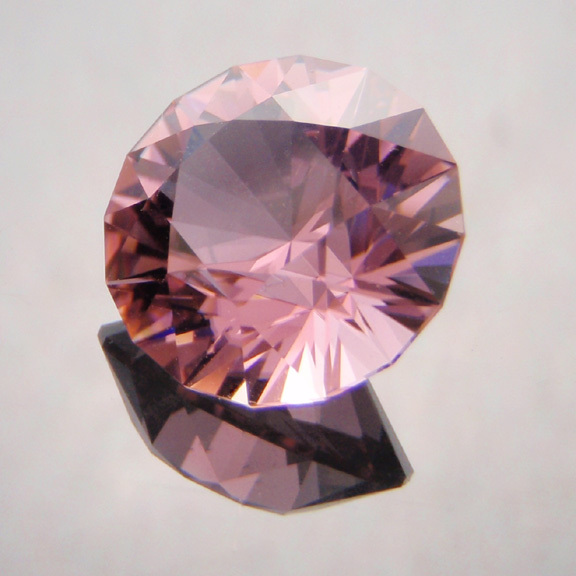 There are lovely violet flashes and maybe a hint of peach but its very hard to tell. 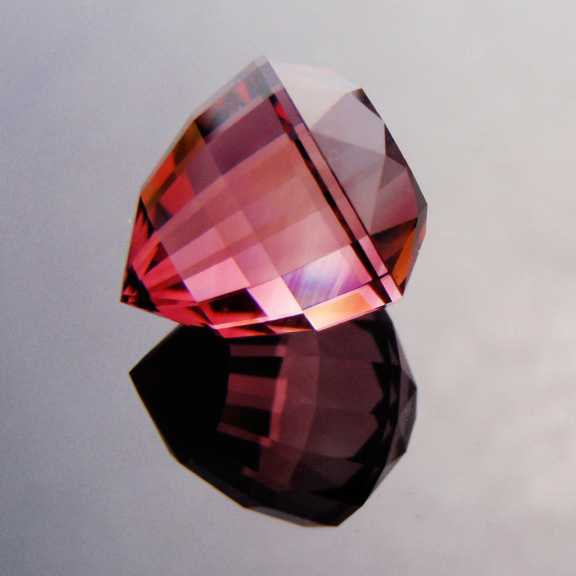 It is finely cut in my "Acorn" design which enhances the colour and also provides excellent brilliance and "fire". 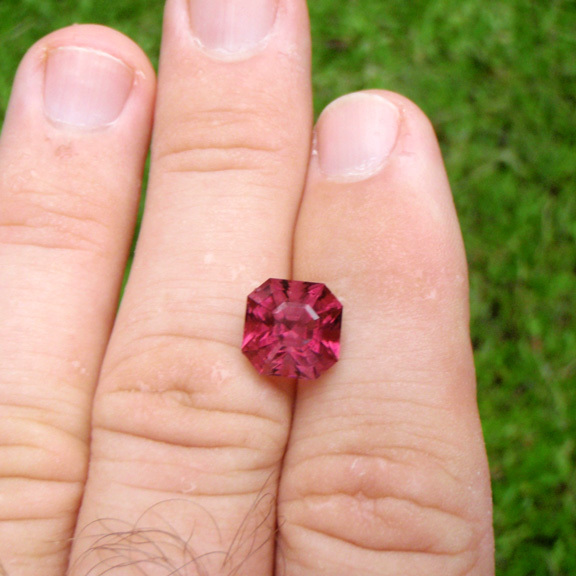 This gem will make a perfect solitare and is ideally suited for a white metal like platinum or white gold. It is eye clean and an excellent size and represents the highest quality material that Afghanistan is renown for. 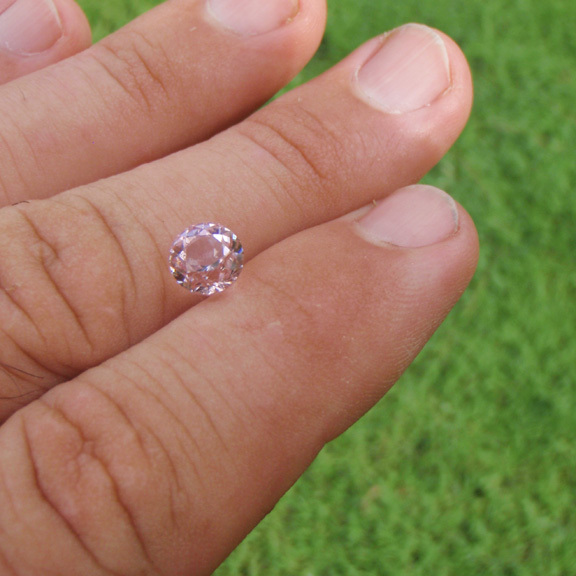 This gem is actually a bi-colour having the main pink zone in the pavilion and a very soft mint green in the crown. 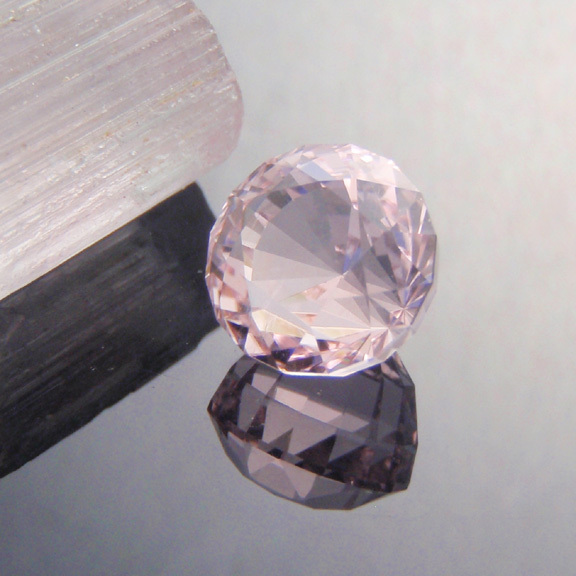 One of the pics shows the stone just prior to being cut and the two colour zones can clearly seen. The proportions and orientation of the colours zones are perfect. In the finished gem the mint green does not really show up in the gem unless it is viewed from a side angle... you can also see it in some of the reflections. 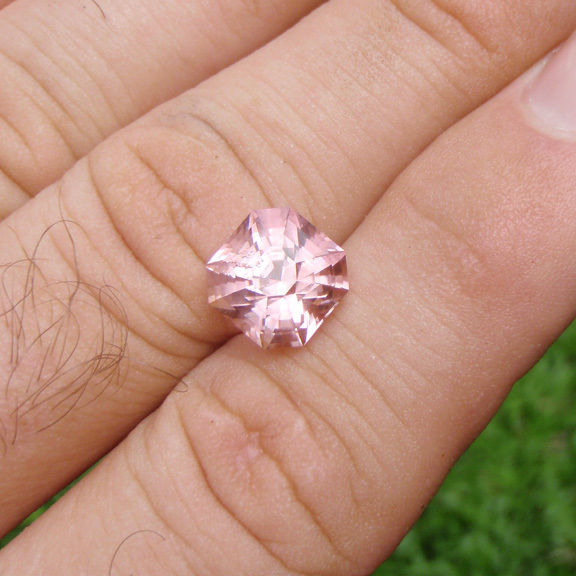 From the top you wouldn't know it was there and for all practical purposes it's just pink. 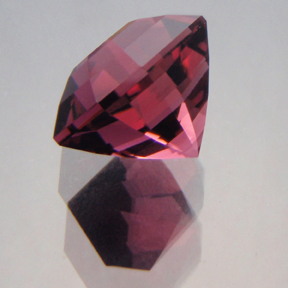 This all adds to the uniqueness of this gemstone. In the other pic you can see the crown about to be cut... the mint green section can again be clearly seen. 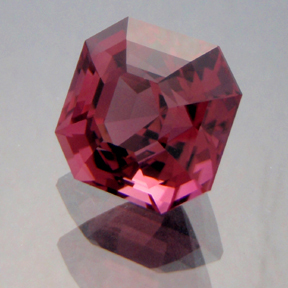 This is truely a fine gemstone all round. Comments : This is a nice pink tourmaline from Nigeria that is cut in the classic Smith Bar design. 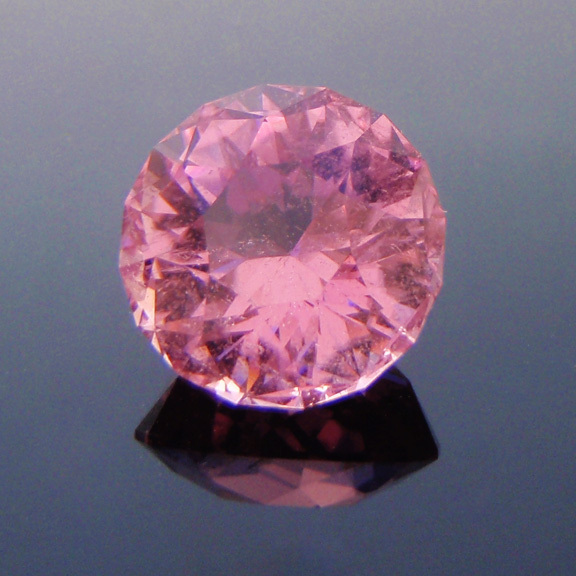 The pink flash is nice and bright and there are some lovely peachy orange flashes in there as well. The gem is well sized for a ring and it is cut in a calibrated size so it should fit a standard setting without any difficulty. I like the "pixelation" action in this Smith Bar design when you tilt it backwards and forwards. 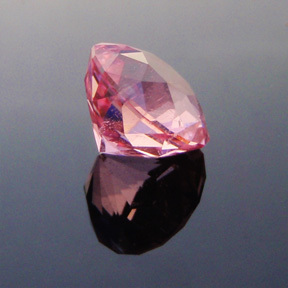 There is a very small veil in the crown but nothing that detracts from the appearance of the gem. 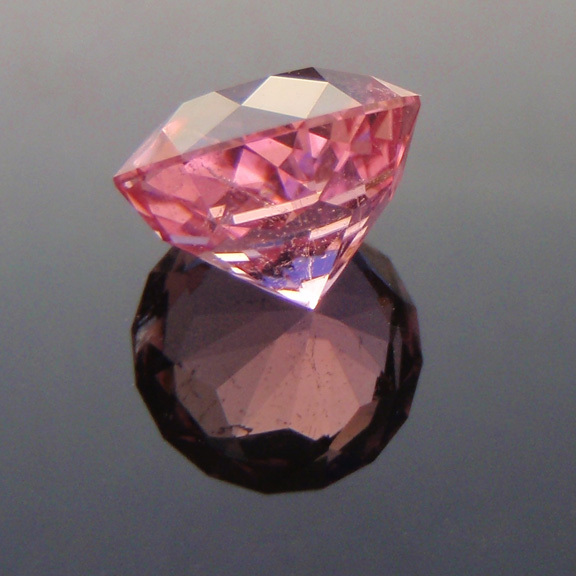 A fine pink tourmaline gem! Comments : Well, what can one say about a gem like this other then that it's simply magnificent! I can use all the superlatives and still not come close to describing its beauty. 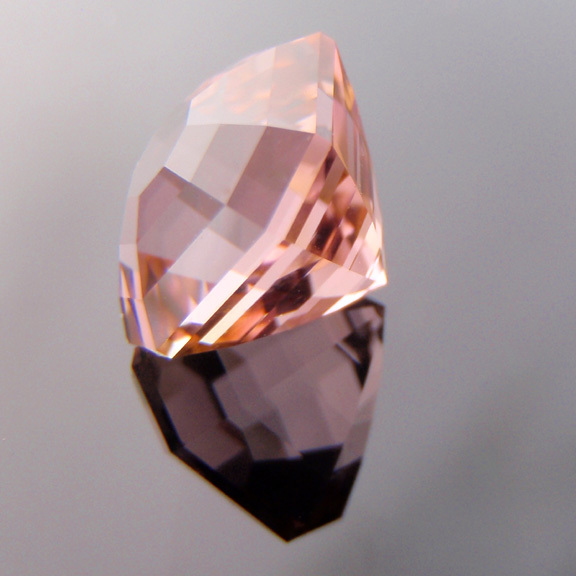 Its a nice light bubblegum pink though for some reason when I gaze at it I keep thinking "princess" pink. Its a very bright and lively gemstone with lots of action and great fire... in the sunlight its dazzlingly blinding and under incandescent lights it really comes into its own. There are also some lovely, delicate violet flashes to be seen. 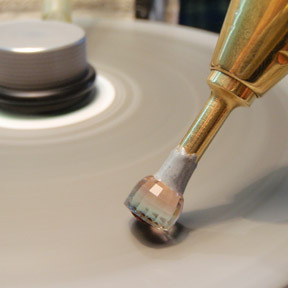 The gem is cut in my "Acorn" design which gives a very classical shape, like those beautiful grecian urns from an earlier age. Did I mention that its BIG! And not only BIG but EYE CLEAN!!! 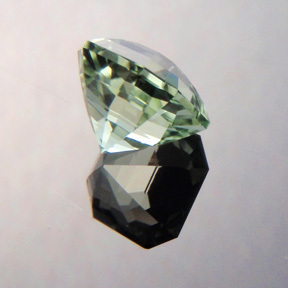 Eye clean gems of this size in tourmaline are as scarce as hen's teeth. 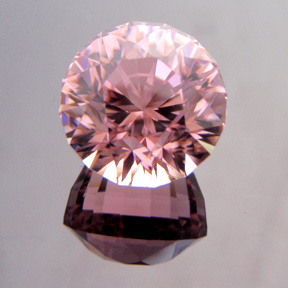 This gem is also actually a bi-colour, having a clear zone in the lower part of the pavilion changing to the bubblegum pink as it moves up to the crown. Having this clear zone adds a really bright kick to the gem and keeps it nice and open. There is a pic of the rough stone prior to being cut and you can see the colour zones clearly. 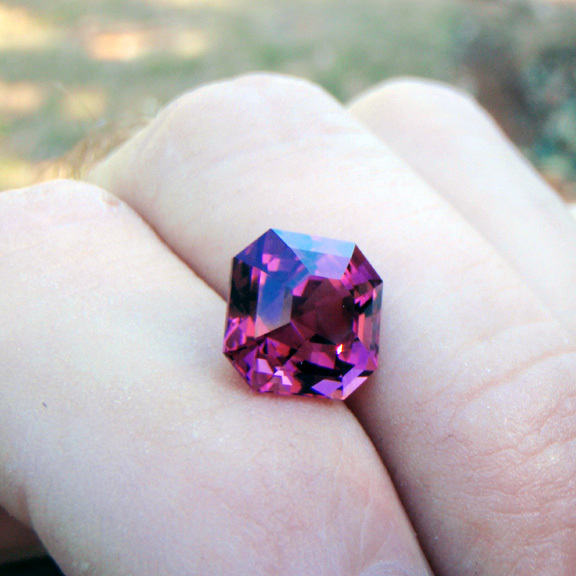 Like most pics, they never really capture the full beauty of the gemstone in person. 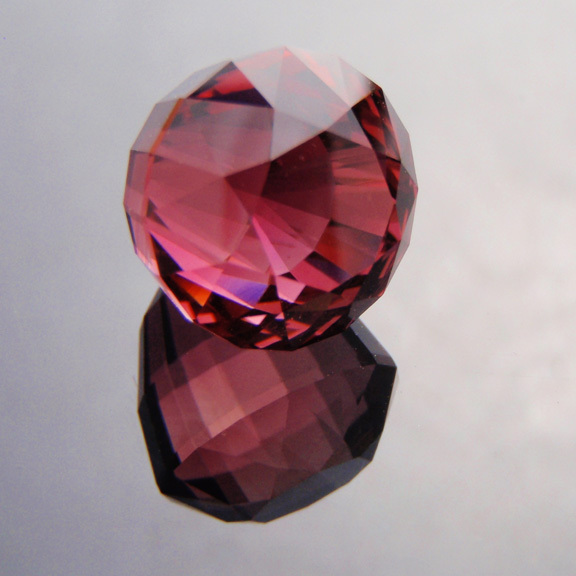 This unique gemstone will make a superb addition to any collection... you'll be looking for a long long time before you find another gemstone that even comes close. Truly exceptional! 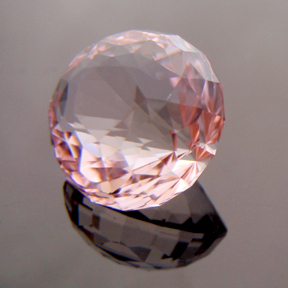 * Suggested wholesale price per carat for a gem of this size, type and quality ranges from $275 - $400 USD. 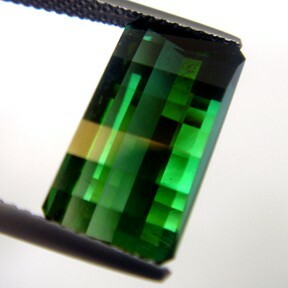 Comments : A great example of a bi-coloured tourmaline from Afghanistan. I'd say its a darker mint green fading to clear. 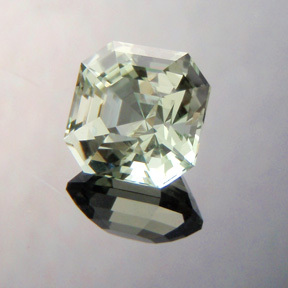 It is very bright and glassy and looks sharp and crisp. 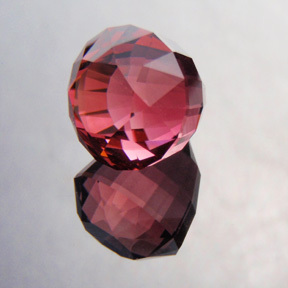 There are some minor inclusions which are typical to tourmaline, they're not as bad as they look in the pics. Its a good size and all round a lovely gem. 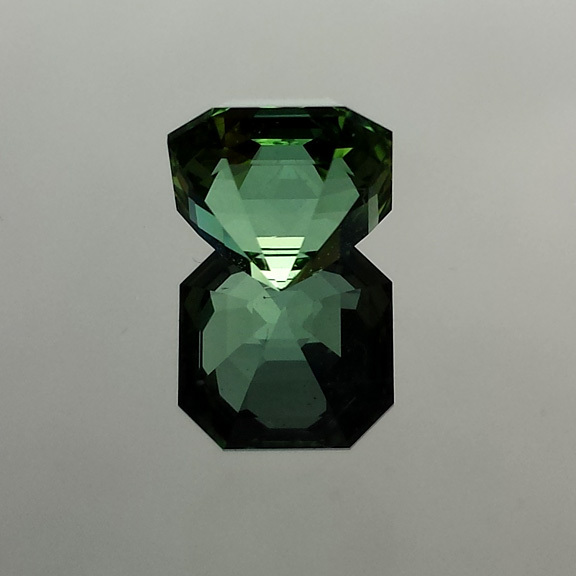 It has an open "C" axis which means it is not dark and instead has a very bright lime green colour down the "C". Comments : It's big and it's beautiful! 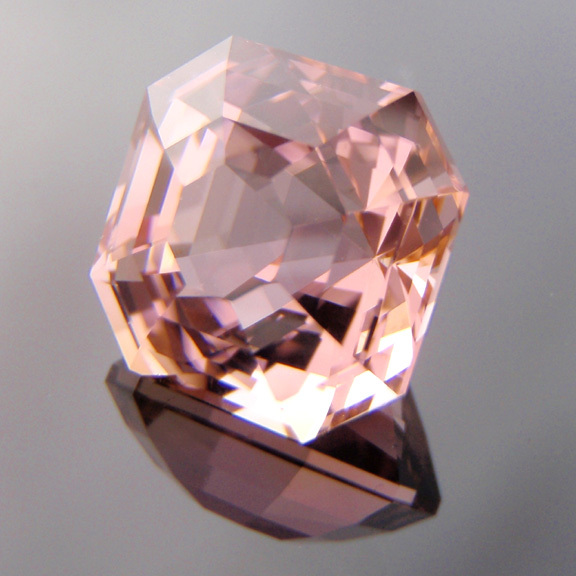 This is a luscious asscher cut pink tourmaline and eye clean. 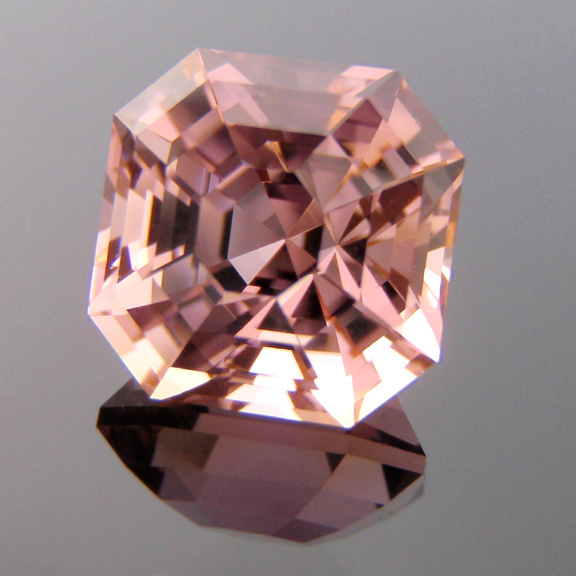 In person it has rich cranberry pink tones with secondary peach tones (the photos just don't do this gem any justice). 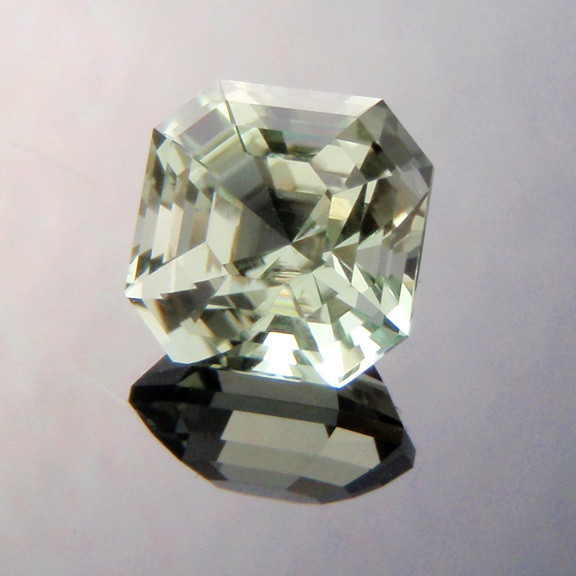 This is a top shelf asscher cut tourmaline gem and you don't often come across flawless gems of this size, colour and quality. * 25/7/2011 - I have taken some more pics of this tourmaline to try and capture the colour and its personality. I was never really happy with the original pics as they seemed a bit dull to me. I have kept the original pics but moved them to the end of the list. The new pics are at the front. There are a number of outdoor hand shots. The ones that have nice green grass in them I took down at Bowen on the coast around January during the "wet" season, which explains the glorious lush grass. The not-so green grass shots are from here at Mt Surprise. 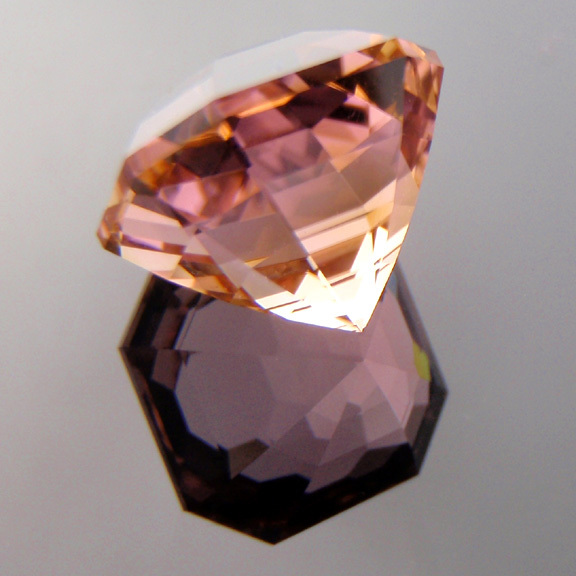 I'm quite amazed at the difference in the colours of the gem and I can only put it down to the variations in the actual sunlight between the coast and inland, and the time of year. * Suggested wholesale price per carat for a gem of this size, type and quality ranges from $250 - $300 USD. 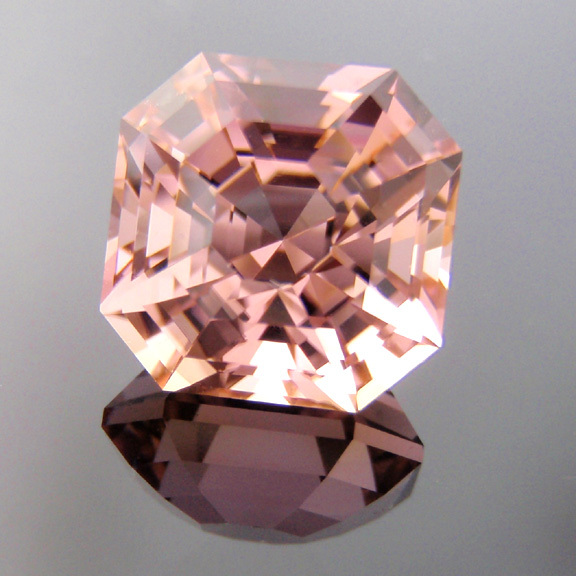 Comments : This is as fine an asscher cut pink tourmaline gemstone as you are ever likely to see. 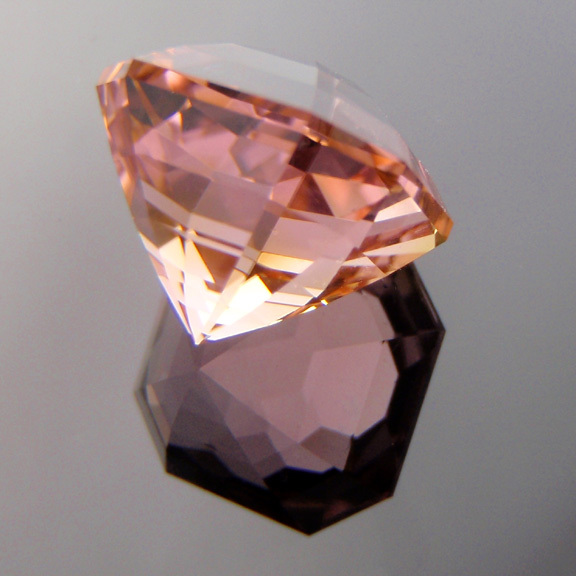 Lovely delicate pink tones with golden peach highlights. There is also a blush of soft violet that appears in the right light that is beguiling. The gem is eye clean which can be hard to find in tourmaline this size. 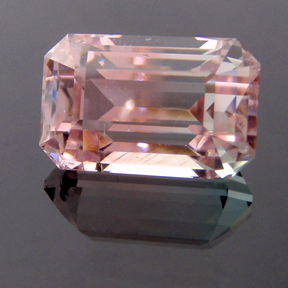 The design is the traditional favorite Asscher Cut which is well suited to light pink tourmaline like this one. 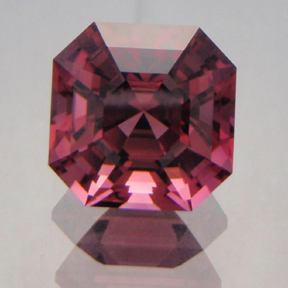 A truely fine asscher cut tourmaline gemstone. 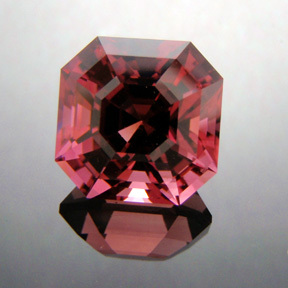 Comments : A vivid hot pink tourmaline cut in a bright modern variation of the round brilliant. This is a spectacular gem that will catch the eye across the room. The pink is intense and rich. 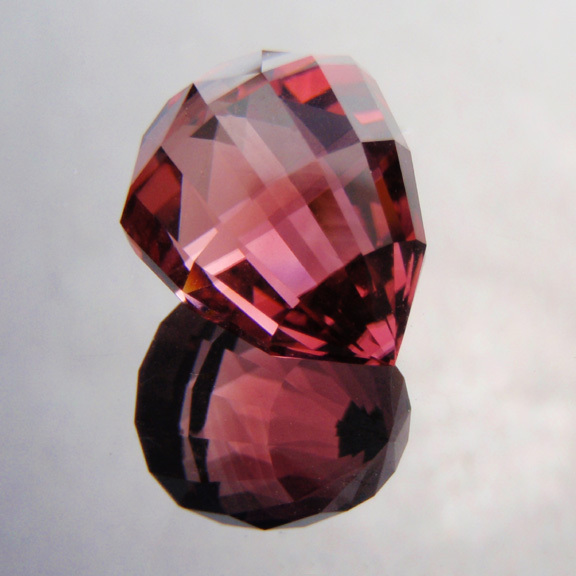 An exceptional gemstone. 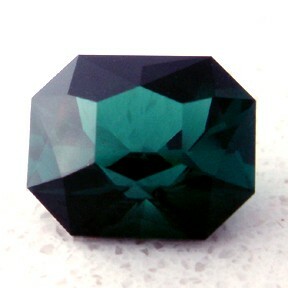 Comments : The stone has a blue/green colour but is a little on the dark side. Would be suitable for a ring setting. 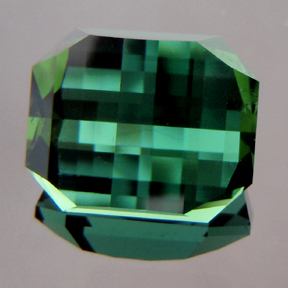 Comments : This is a classic blue / green tourmaline from Afghanistan. 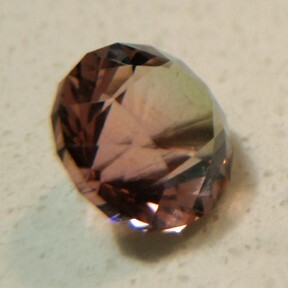 The colour saturation is excellent and there are definitely three distinct colours that I can see in this stone depending on the angle viewed. There is a nice blue (teal? 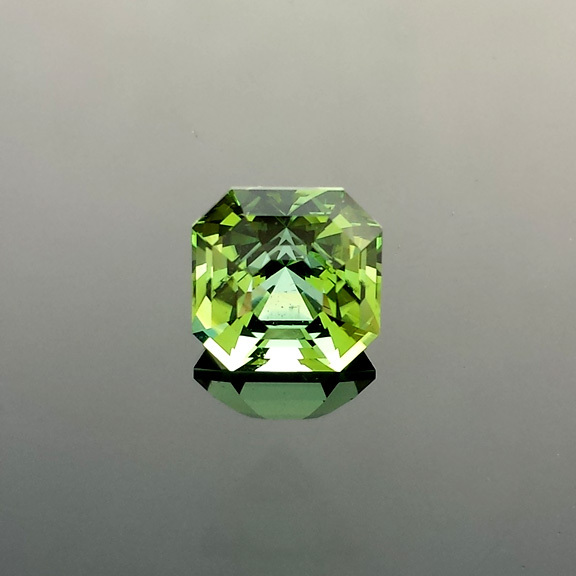 ), a grass green and a bright and lively lime green. 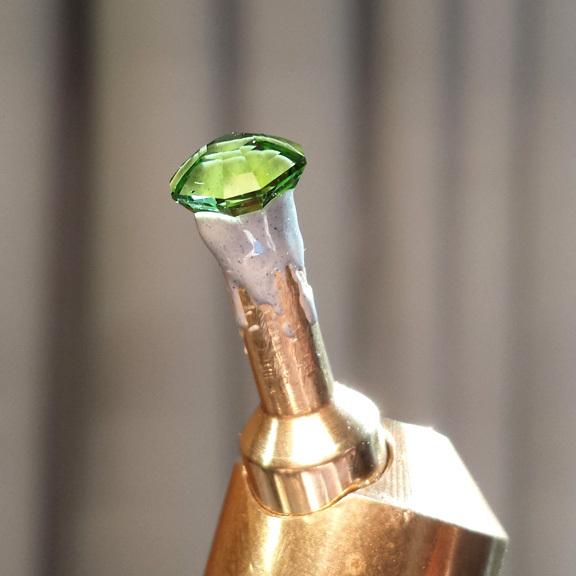 This stone was cut from a piece of rough that had an open "C" axis and this is what gives it the bright lime green colour. This is an excellent stone cut in a modern, flashy design... top shelf quality. 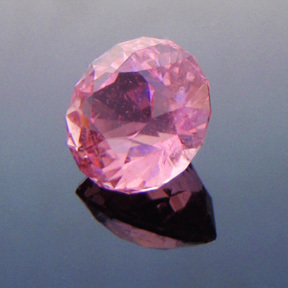 Comments : Without a shadow of a doubt, bubblegum pink tourmaline from Afghanistan would have to be one of the most delicate, elegant and beautiful of gemstones. 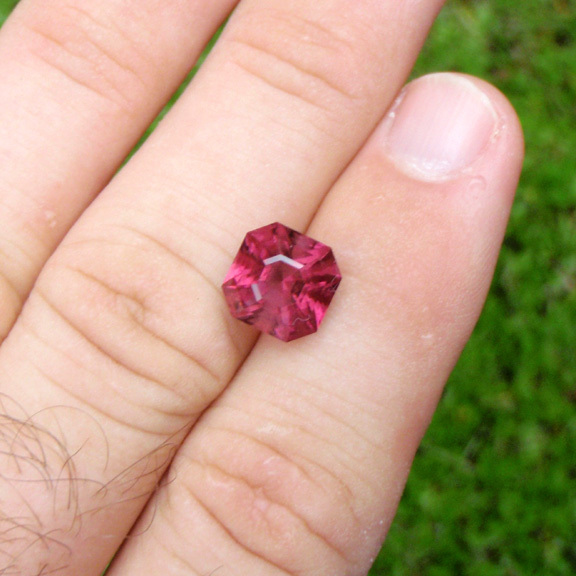 Straight off, I have to tell you that the photos simply do not do this stone any justice. 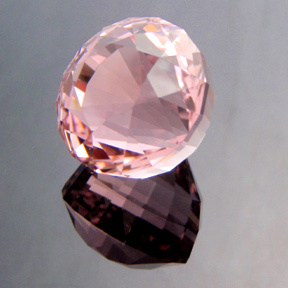 In person this gem is light and airy, with a lovely, deliciously soft bubblegum pink and nice delicate tones in any lighting. 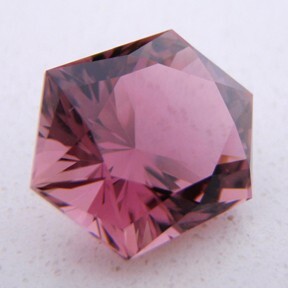 In my opinion, this gemstone would be stunning set in either white gold or platinum as I think the white metal would complement it perfectly. 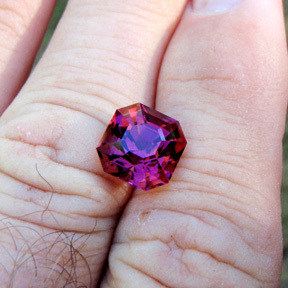 The gem is eye clean and an ideal size for a ring. I have cut this in a slight variation on my 161 facet Phi Flower Dome design which gives it a bit more of a rounded dome look. 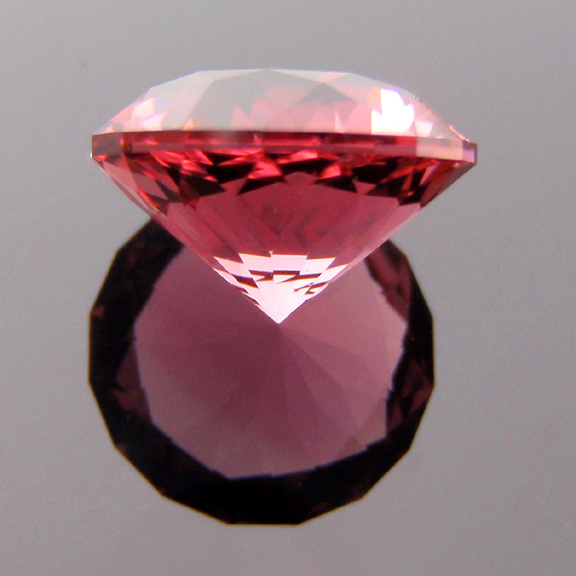 This is a truely unique gem! Comments : This is quite an interesting gemstone. 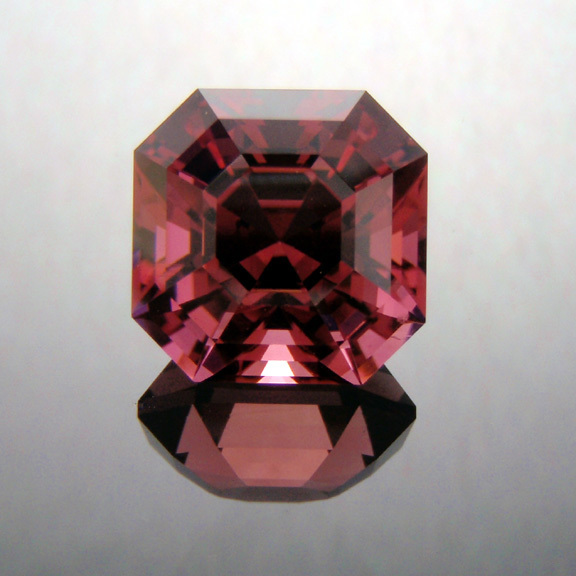 It is a tri-colour tourmaline from Afghanistan and is exceptionally glassy and bright, very much so. 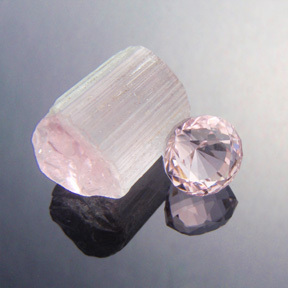 It is predominately a soft bubblegum pink changing to clear and then a very soft minty green. The original rough stone had a very pronounced minty green segment mostly in the tip and in rind however this was cut away during the faceting process. I tried to keep as much as possible in the final stone. 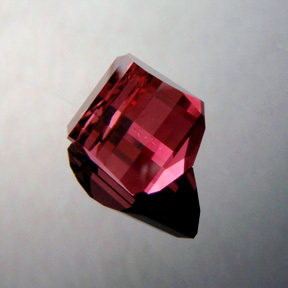 It does have inclusions that are typical of tourmaline and most of these are located in the corners which, depending on the setting, will mostly likely be hidden. Under incandescent lighting it is just as stunning as in daylight. Comments : If this were a sapphire it would be called a "parti-colour". 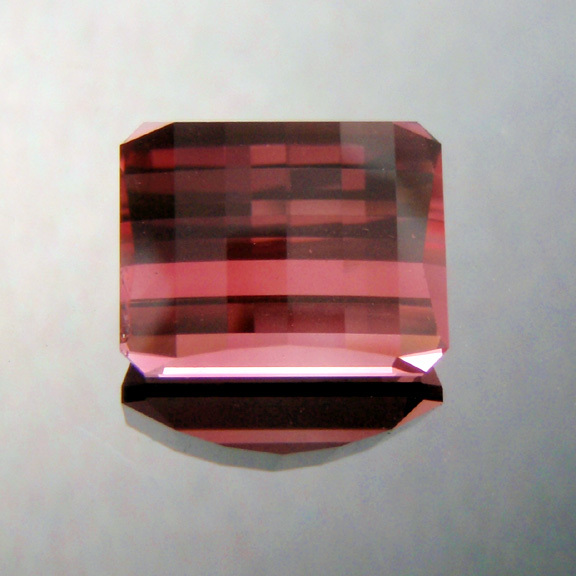 This is "sunset" tourmaline and is quite a unique little stone. It is predominately a rich golden amber colour with a bar of a sort of golden lime colour. 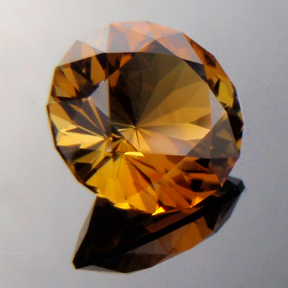 The stone viewed face up is evenly divided into three colours zones : golden amber / lime / golden amber. 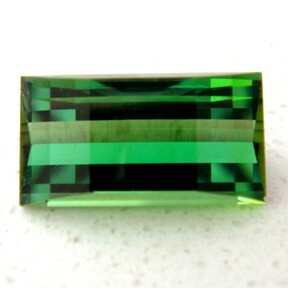 It would be an excellent "aussie" stone with its green and gold colours. The lime green colour isn't really shown well in the photos however you can see a lighter colour bar running across the middle of the stone. In person, these three colour bands are clearly visible even with the gemstone held at arms length. 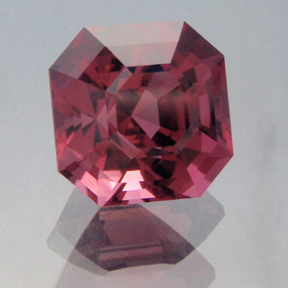 Comments : This colour is as good as it gets for a hot pink tourmaline! It is a delicious, mouth-watering pink! 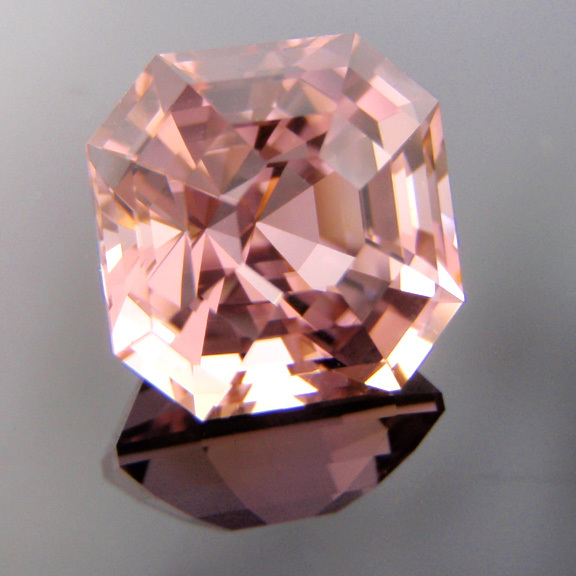 The colour is pure with no peach or off-colour overtones. The design is quite modern and together with the colour makes this a very desirable gemstone. 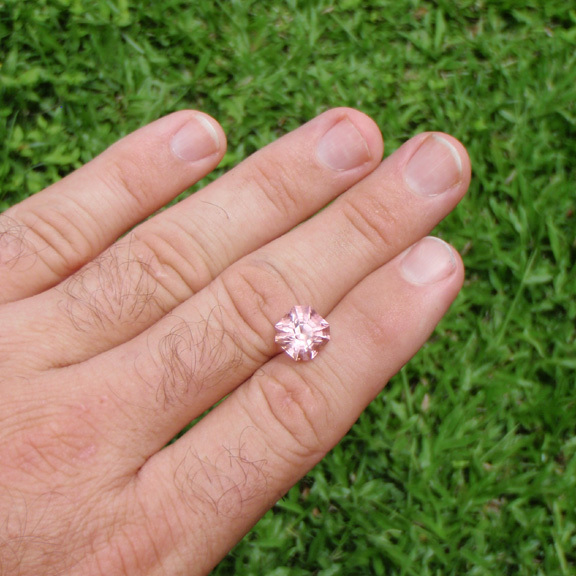 It will make a fantastic ring that will stand out of the crowd, especially set in a white metal... either white gold or platinum. 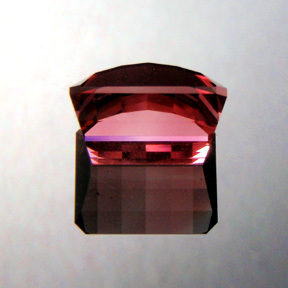 Comments : This is a very nice tourmaline cut in a modern design. 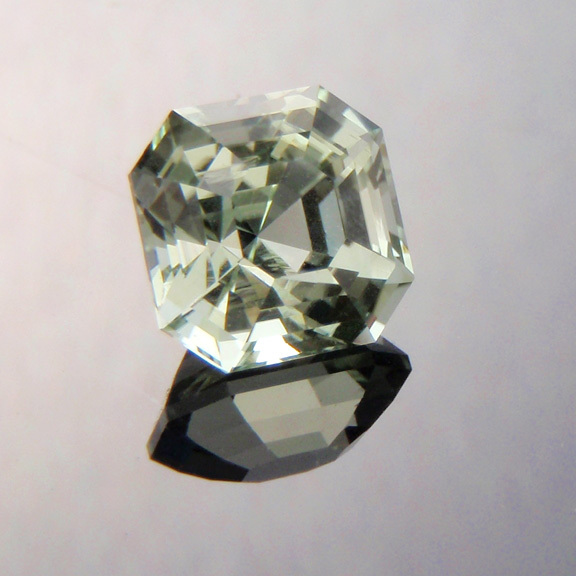 It has an apple green colour and is darkish towards one end, fading to lighter tone on the other end. There is a very slight feather veil on the bottom of one end of the keel and several small inclusion scratches near one end of the pavilion. Viewing the stone face up they are not noticeable. 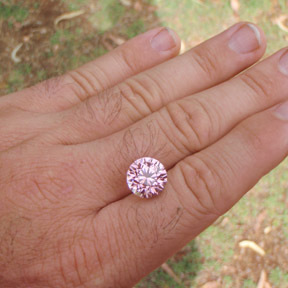 This would make a good men's ring. 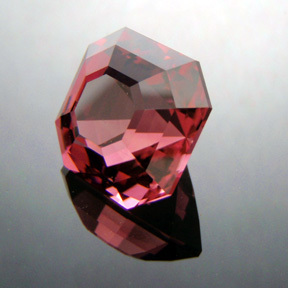 A fine gem. 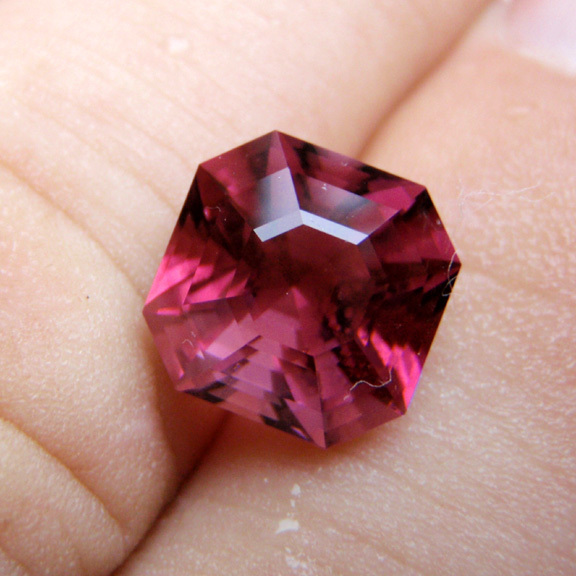 See this gemstone being cut. 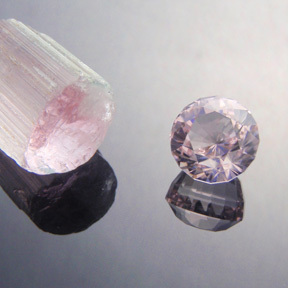 Comments : A sweet little watermelon tourmaline, pink with a hint of mint green. 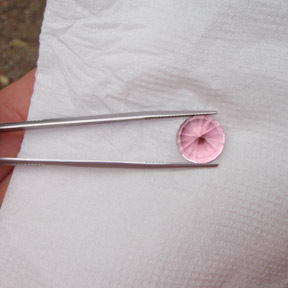 There is just the tiniest of needles at one point near the girdle which will be hidden when set. 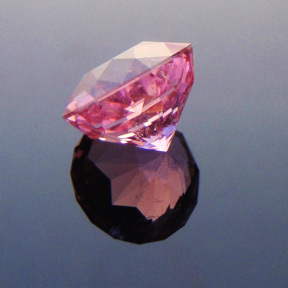 A lovely ring stone. 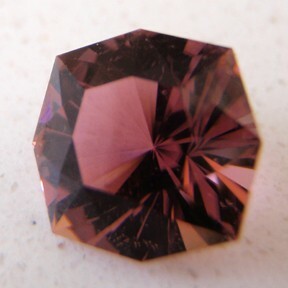 Comments : This gem has nice sparkle and is cut in a modern design. Good green colours. 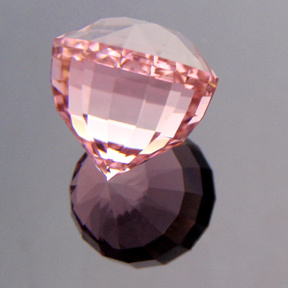 Comments : A lovely little pink tourmaline cut in a bright and sparkling classic design. 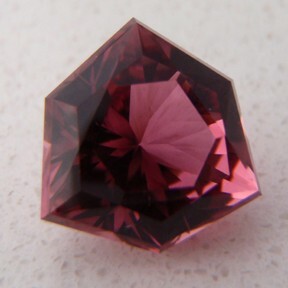 This will make a beautiful ring stone. 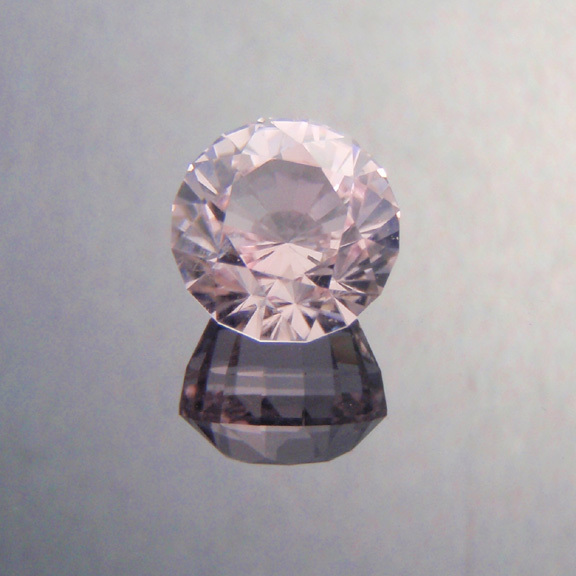 There are some tiny bubble inclusions but nothing that will detract from the stone. 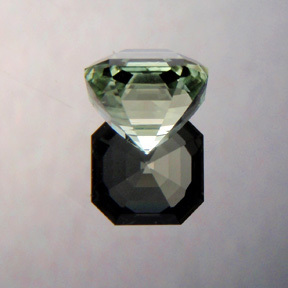 Comments : A green tourmaline cut in a 2:1 ratio. 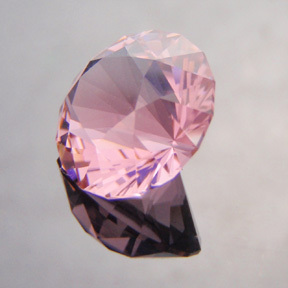 It does have some of the inclusions that are common to this type of stone but still a good stone. Comments : A very nice teal coloured gem... quite a pretty stone. 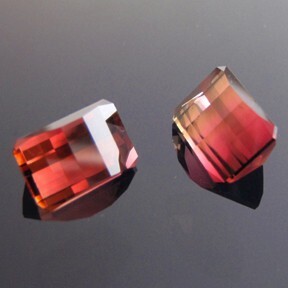 Comments : These are a top pair of bi-coloured tourmalines. 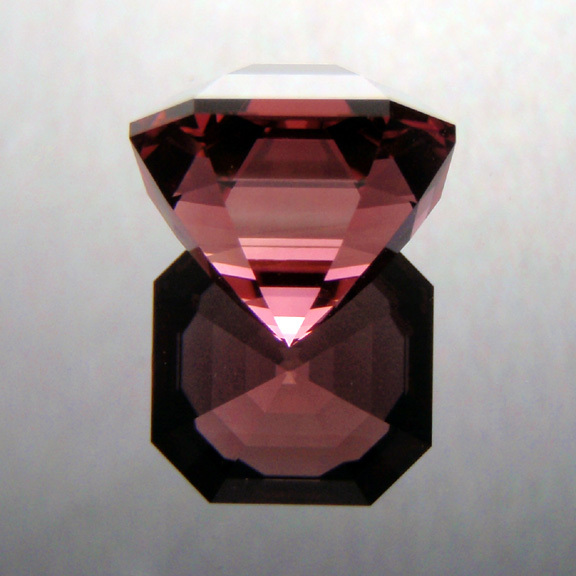 The two colours are raspberry and gold and blend well. The Smith Bar design really works a treat with these gems. Even though one of the stones is slightly bigger, I think they are a good matched pair. 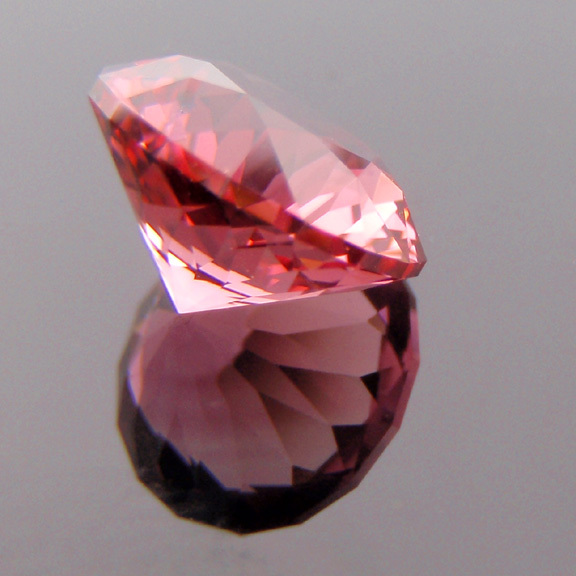 Comments : A magnificent hot pink tourmaline! 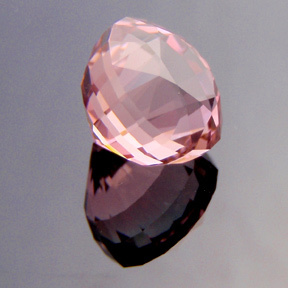 The gemstone is flawless and cut in a modern, high performance design with lots of flash. This colour is as good as it gets. 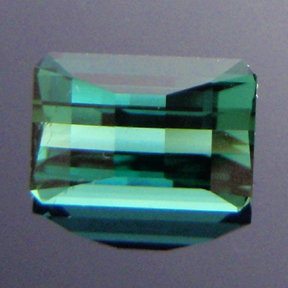 Comments : This is an excellent example of the blue/green coloured tourmaline that comes from Afghanistan. 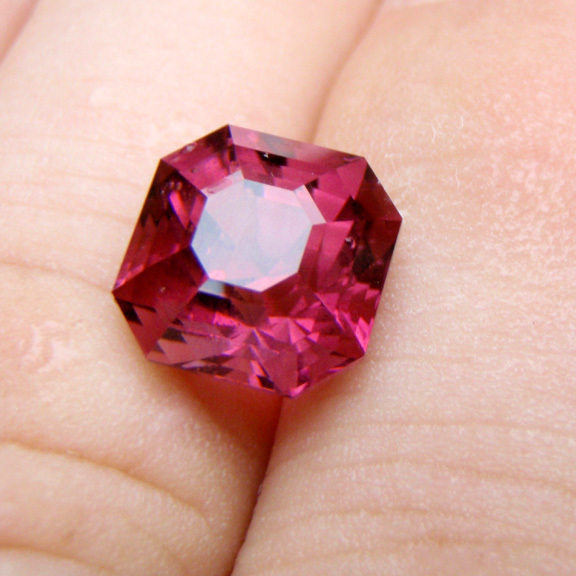 It is flawless and the colours much more vivid then they appear in the pictures. It is cut in the classic Asscher Cut design and works extremely well. This is a top asscher cut tourmaline gem! 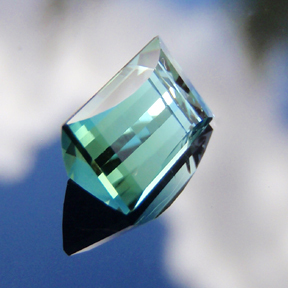 Paraiba = Caribbean blue, copper bearing tourmaline... very rare! 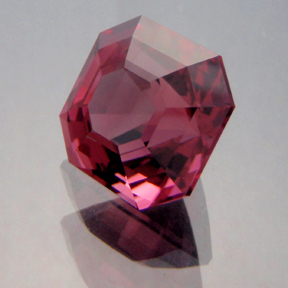 Birthstones : Tourmaline is the birthstone for October. 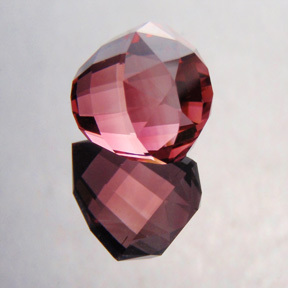 Comments : Tourmaline is a gem that comes in almost every colour imaginable and often in breathtaking combinations. 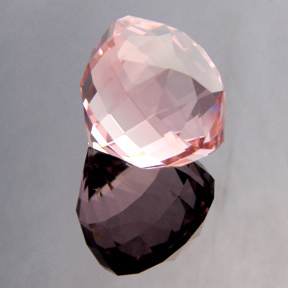 It is thought that the Dutch, importing it from Sri Lanka to Europe in the early 1700's gave it the Sinhalese name, Turamali, meaning "stone with mixed colors". Gems with two or three colors are much sort after, such as blue/greens, mint greens/clear, pink/greens and gold/red. 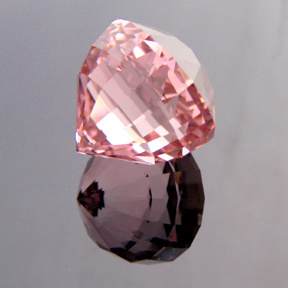 For example, a certain mixture of colours is called watermelon tourmaline where, cut in a cross section, the outer rind appears green whilst the inside is pink. 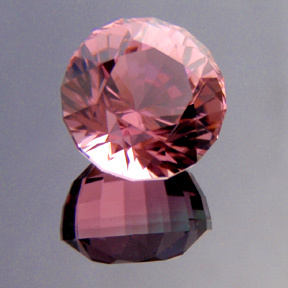 Pinks (intense hot pink and light bubblegum pink), reds and blues are the most desired colors. Some tourmaline gems are treated in order to improve their colour. 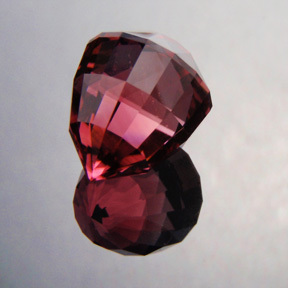 In the last 20 years tourmaline has gained great popularity among gem collectors and the gem buying public because of its beauty, availablity and myriad colors. 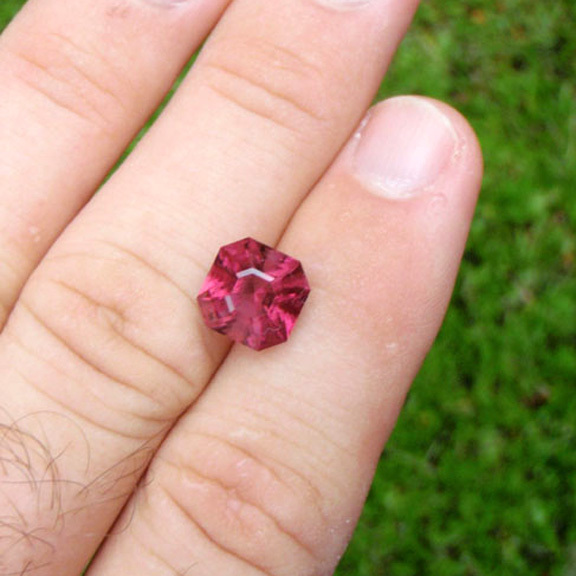 It cuts a stunning gem and suits almost all design styles. 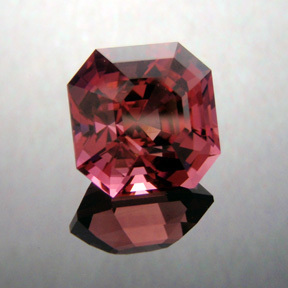 Fine examples of tourmaline can be obtained in relatively large sizes though 2 - 10 carats is a popular size range. 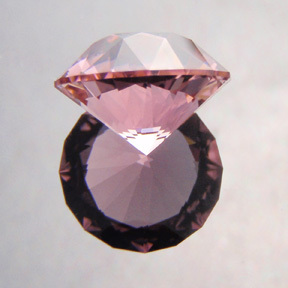 Tourmaline often has inclusions and eye clean gems are the most desirable. 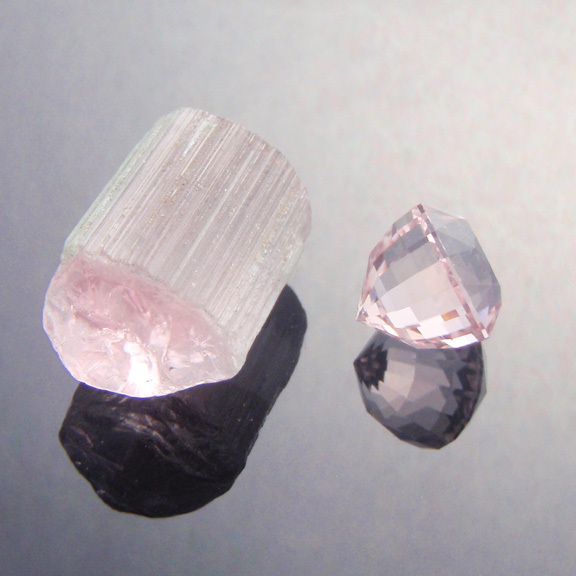 Tourmaline forms as beautiful long crystals and are a great favorite among mineral specimen collectors. 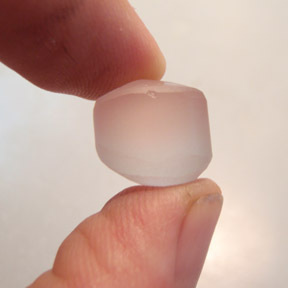 This stone can also be found in alluvial deposits as water worn nodules. 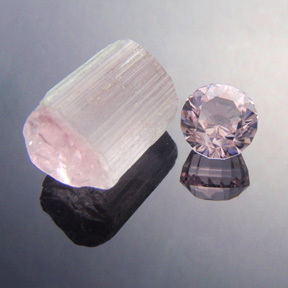 A curious property of tourmaline is that when heated and cooled, or by applied pressure, it will become electrically charged (pyro and piezo electricty). 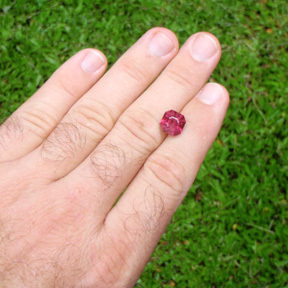 The charged stone can attract pieces of paper and dust. 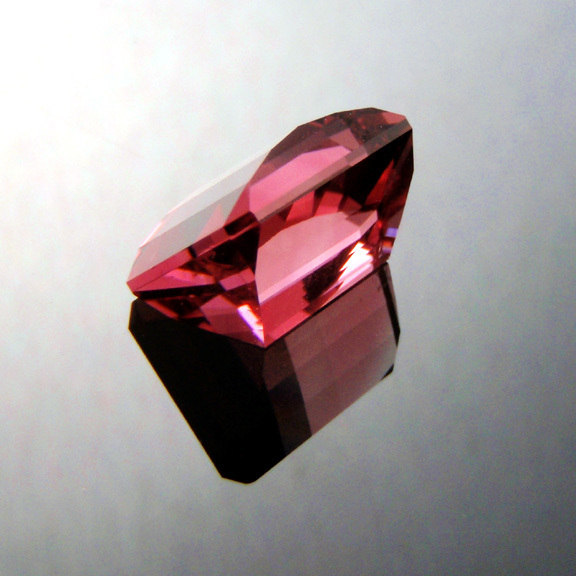 It was also used to pull ash out of meerschaum pipes by the Dutch who understood this property of tourmaline. 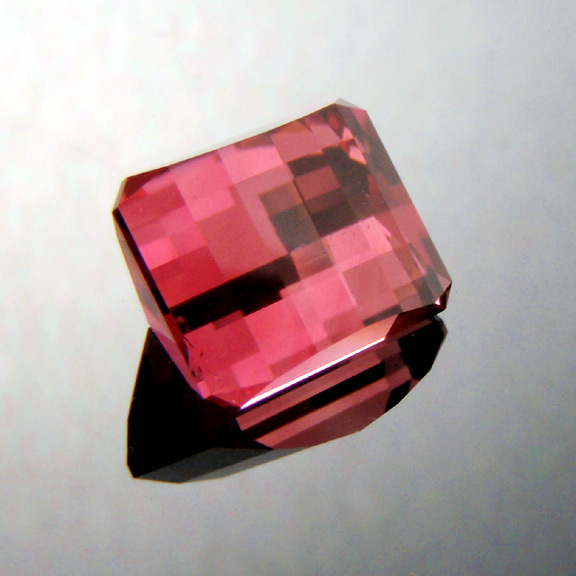 They called tourmaline "aschentrekker" (ash puller). One thing that can affect the colour and arguably the "quality" and price of a tourmaline gem is if it has what's called a closed "C" axis. What does this mean? 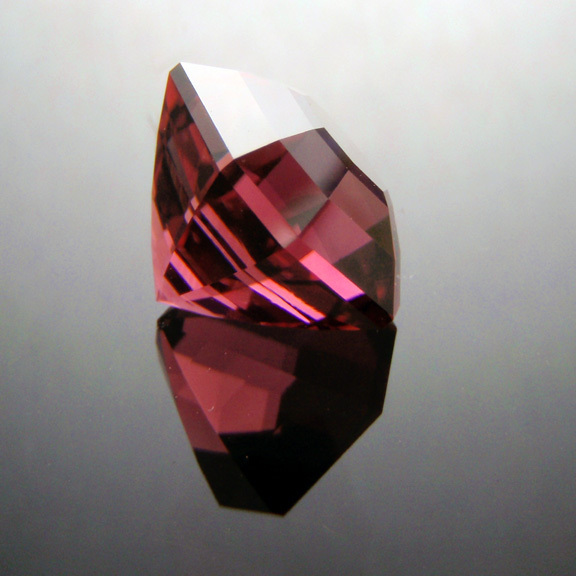 Well, given a tourmaline crystal in its original shape, if you look down the crystal (as if you were looking down a metal pipe) and it appears black or very very dark, this tourmaline is said to be "closed", like pulling a curtain across a window. 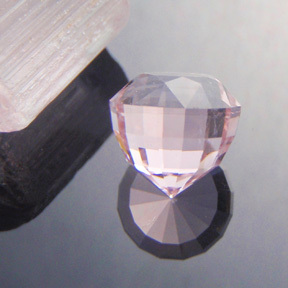 If you can clearly see down the crystal even though the colour may change slightly, eg. 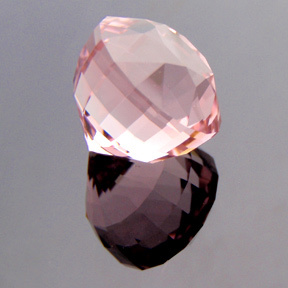 a pink tourmaline might look peachy down the "C" axis, it is said to be "open". When a tourmaline with a closed "C" axis is cut, the resulting gem will in all likelihood appear darkish, especially around the ends if it is a rectangluar design. 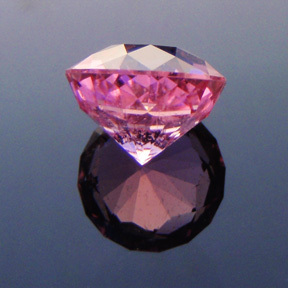 All things being equal, an "open" gem should demand a higher price then a "closed" gem. You can see an example of an open "C" axis tourmaline in the rough here.